As a graduate of Spelman College, I have fond memories of my AUC (Atlanta University Center) days. In Atlanta GA, Spelman, Morehouse, and Clark reigned supreme in the black mecca. It was nothing to step foot on campus and see impeccably dressed individuals at all hours of the day. Just taking a quick stroll around the campuses quickly dispelled any stereotype held about black people in the media. Contrary to what is shown on reality tv and some music videos, we were educated, poised, and well dressed. This became especially prominent when I would take classes or attend activities on the campus of the famed Morehouse College. Strolling along the campus of Morehouse felt like I was walking through the pages of GQ. Going to class, a Morehouse man may wear Prada loafers with an Hermés belt around the waist with a vintage leather briefcase in hand. Appearance was artfully crafted and meticulous going beyond just putting on a well-tailored suit. They brought about a certain presence on the college campus. When in the presence of these individuals someone walking by in a hoodie may suddenly feel as if they are in a state of undress. I believe that this is when I first encountered the Dandy. Tall top hats and sweeping coattails on white Victorian Era gentlemen are the first images that come to mind when we think of Dandy. I’m sure Yankee Doodle Dandy comes to mind as well. However, The Museum of Contemporary Photography is showing a new modern kind of Dandy in Dandy Lion: (Re)Articulating Black Masculine Identity. The top hat is instead replaced with a Kufi and a solid color pocket square now features a vibrant print. The stunning exhibit highlights black sartorialism with images from world renown photographers. From New York, Chicago, Paris, and Milan the Dandy can be seen just about anywhere. In a world, where we are inundated with negative images of black males in the media, Dandy Lion provides a safe haven for celebrating black sartorial excellence. I wanted to learn more about the Dandy through the eyes of one of the featured photographers, so I sought out the guidance of world renown photographer Sara Shamsavari. Sara’s works have received high praises from publications such as Vogue, Elle, and The Guardian. While her images feature breathtaking pops of color, it’s the powerful messages that give her works such a profound impact. Through her lens, she has uplifted the veil and highlighted hijabistas and now she is focusing her lens on the dapper gentlemen known as the Dandy. If a picture is a worth a thousand words, the works of Sara Shamsavari tell the story. Without further ado, here is the Dandy through the eyes of the one and only Sara Shamsavari. TCL: For those who aren’t familiar with the Dandy or Dandyism. In your own words who/what is the Dandy? SS: It’s funny because many of the gentlemen I photographed would not actually refer to themselves as dandies. Baudelaire described a dandy as “one who elevates æsthetics to a living religion”. I like this as it emphasizes the idea that dandyism goes beyond dressing exquisitely and extends to the way a person carries themselves, their manners, and their pastimes- it’s not just about the suit. TCL: What was it about Dandies that drew you to this particular subject matter? SS: For me, it was Shantrelle P. Lewis’ groundbreaking concept for the Dandy Lion Project that drew me in. This is a movement, a subculture that refuses to accept the narrow one-dimensional image of Black Men that is perpetuated in western media. It is an elegant and beautiful form of rebellion that is growing and becoming a choice for more and more men. The philosophy behind this show felt so deeply in line with my values as an artist creating works and projects that challenge stereotypes. TCL: When you are selecting a subject to photograph, what are characteristics that you are looking for? What went into the decision process when deciding which works should be featured in the exhibit? SS: As curator Shantrelle selected the final images but in the run up I produced a lot of work, starting with friends then extending outward to include more and more people. I would look for gentlemen who exuded a particular manner and energy. When it comes to style I photographed an array of gentleman from the more classically dressed man such as politician and entrepreneur Louis Charles Aka and designers Kevin Kittoe and Sam Mingle to the daring colourful Samson Soboye who dazzles us with his use of colour and print. I love colour as you can see in the images of music producer Calligraphist and style icon and blogger Martell Campbell. For me when I look back at a photograph and it looks alive like it has its own life- it’s a clear choice. TCL: Reflecting on the different subjects throughout your career, how does the Dandy reflect your body of work? SS: The Dandy Lion Project is closely aligned to everything I stand for as a person and as an artist. The concept challenges the image we are constantly bombarded with in the mass media. At a time where there is still great misunderstanding and negativity directed towards certain groups of people often depicted in a very narrow and one-dimensional light and this project, like my Veil Series that looks at young women in western cities who wear hijab or my series Britain Retold- a Portrait of London which allows the multi communities of London to examine and redefine ‘ Britishness’ Shantrelle P . Lewis’ The Dandy Lion Project is both beautiful and meaningful and gives the audience a fresh perspective. TCL: The premise of the exhibit is to (re)articulate black masculinity. How would you say this exhibit is (re)articulating the current constructs of black masculinity? 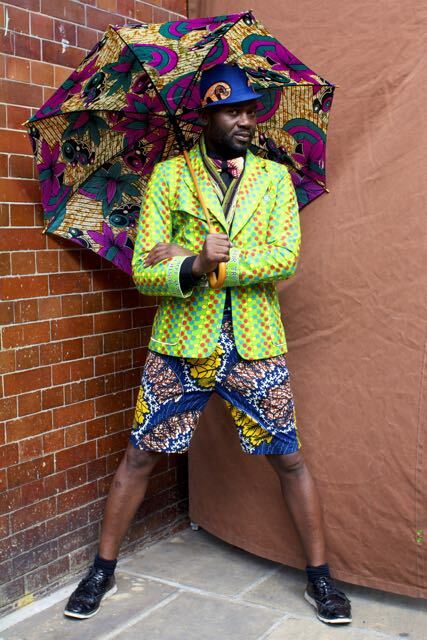 SS: The project challenges stereotypical and monolithic understandings of black masculinity across the globe by presenting an image of exquisitely and sartorially dressed men belonging to the African diaspora from across the globe. This image stands in stark contrast to the baggy pants image that has been perpetuated for so long. Although I personally believe in freedom to choose how you dress it’s clear that we need to see a variety of styles and people represented. TCL: As someone views your image, what is the message that you wish to convey to the viewer? SS: I believe that artists have the potential to be leaders in social and spiritual progress and I hope that through all of my work I can help people, no matter how different from one another to begin seeing and celebrating each other as human beings. TCL: What would you say are some of the common themes throughout your works? SS: All of my works are underpinned by values such as the celebration of unity in diversity and simply encouraging people to look beyond the surface to the heart, essence and beauty of the next person, to see themselves and each other in a true and positive light. TCL: As you were putting together your works, was there anything that you found surprising or interesting about Dandyism that you didn’t previously already know? SS: Everything exists, that’s one thing you take for granted when you come from a cosmopolitan city, something that has been reinforced for me as an artist who looks at subcultures. I always think it is beautiful when people across the globe can be united through something very specific and personal, this project does that. TCL: I first learned of your work with the Hijab series. What would you say are the commonalities in regards to self-expression between the black dandies and the women in their hijabs? SS: Very good question and very well observed Like the image of the black man and so many other groups in the minority the image of Muslims in the west, is so misrepresented and maligned. I love the idea of transformation and the space between what the world throws at us and how we choose to respond- whether we let it crush us, whether we conform or whether we take those challenges and transform them into something new and beautiful. Like the men who represent in The Dandy Lion Project the ‘hijabistsa’s’ who feature in my series London Veil/ Paris Veil / NYC Veil illustrate this concept of transformation. TCL: When reflecting on your contributions to the exhibit, which photo from the collection was your favorite and what was the story behind that photo? SS: The 12ft mural of Louis Charles Aka in Paris is my favourite and judging by Shantrelle’s choice to blow it up to 12 foot it may well be hers too. It was spring 2014 and I was in Paris producing my Paris Veil series. I was walking one day near the Louvre and suddenly came the incredible scent of amber mixed with a wood scent, maybe cedar wood, I met Louis Charles for the first time he was impeccably and traditionally dressed, earth colours high waist pants, round glasses pointed shoes. I nearly let him go then I called out to him and told him about the Dandy Lion Project, he loved the concept but asked that we go to quieter streets to make his portrait. It turned out LC was a perfumer the director of La Note Parisienne a company that had created a fragrance for every Arrondissement of Paris. He also held a Masters in Political Science, currently working in politics. He gave me some history lesson of the streets we visited before we took the picture of him among the trees and flower beds. A perfect and contrasting example of a Dandy Lion, existing outside the stereotypes and exuding excellence in every way. The Dandy Lion Project ends its run at the Museum of Contemporary Photography July 12th. To check out more of Sara Shamsavari’s work, be sure to check out her FaceBook page. Also, in the fall be on the lookout for she and writer Tamara Pizzoli’s collaboration “In Nero: Black Girls in Rome” The exhibit is set to debut in the fall and I am sure it’ll be yet another series of stunning imagery with wonderful stories. Special thanks once again to Sara for taking the time to do this interview and also thank you for providing the images and video for this feature.